Jellyfish Jaunt is your typical search for treasures, the adventure taking place under the ocean’s surface. The main hero is a lady that’s exploring the oceans in search for gold filled treasure chests, using a diver’s suit and a submarine. It’s a very common choice for a theme, the slot offering both explorer themed icons and some that show you various types of creatures that the ocean has to offer. The result is a very pretty slot though, as they often are when the underwater world is used as inspiration. 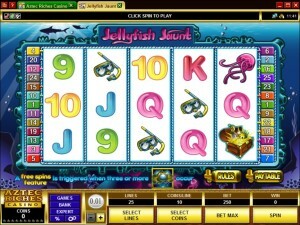 There are 25 bet lines in Jellyfish Jaunt, with 5 reels to host them all. 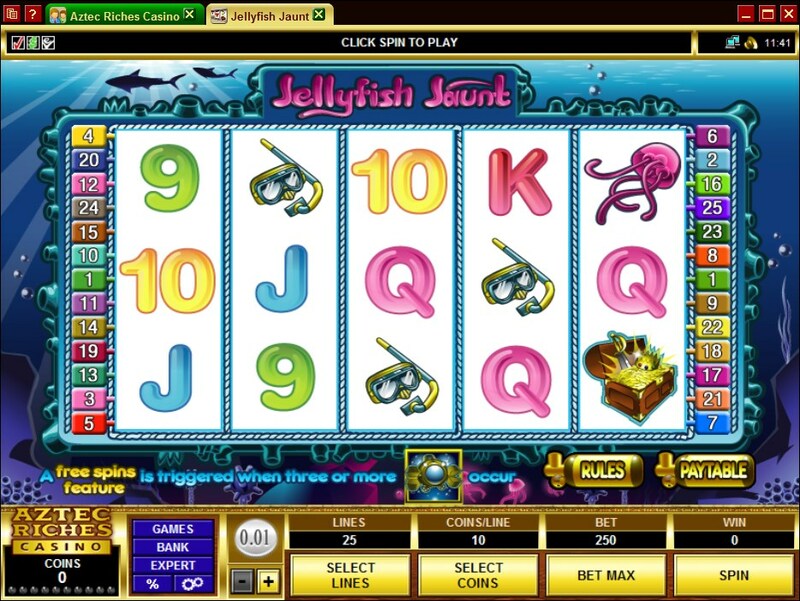 The features are typical for a slot machine of this kind, with free spins, multipliers of 3x, wilds and scatters. The payouts are the ones that are better than average, going up to $45,000. 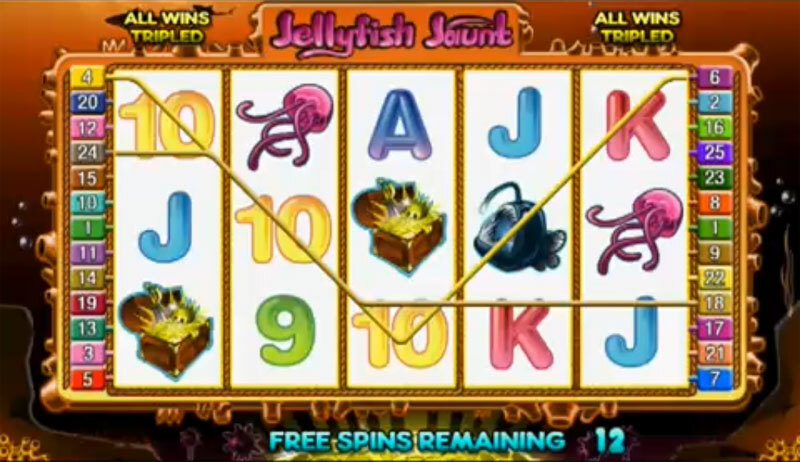 With wild symbols that award big prizes, with scatters that trigger free spins, and with 3x multipliers used in two occasions, Jellyfish Jaunt has plenty to offer new players, even though it doesn’t do anything different from its competitors. The Diver symbol is first on our list, showing us an image of a blonde girl in a diver’s suit. She’s the wild feature of this game, the one that is capable of completing a combination by taking the role of a regular symbol. It will do this if it lands on the right payline, in the right position, otherwise it can’t do anything about it. The odds are pretty good that it will be able to help out though, and it will triple the value of the prize when it does this. Multiple wild symbols, on the same payline, will create their own combo, and that’s the ideal situation to be in since that’s how you can win the top jackpot, of 9,000x. The second symbol on our list is the scatter, represented here by the image of a small Submarine. As a scatter symbol, you probably know already what its powers are, the ability to appear on the reels and give you prizes based solely on the number of Submarines present, not on their position on the same line. 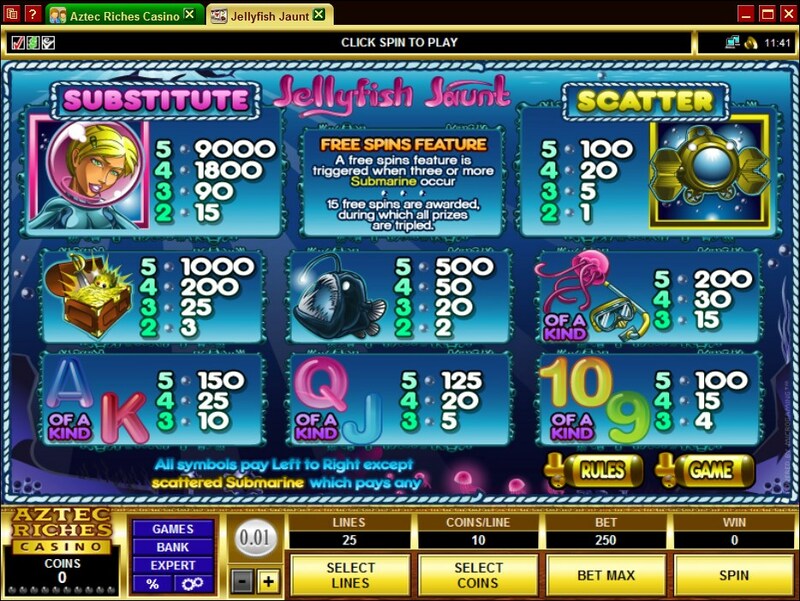 Payouts of up to 100x the bet are offered by the Submarine, with 2 to 5 symbols needed to get paid. 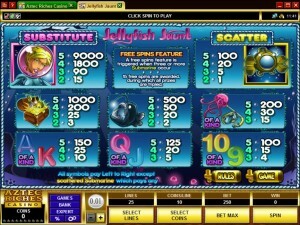 The same Submarine scatter will also trigger the free spins, besides giving you prizes. You receive 15 free spins from it, and all prizes are tripled for the duration of the feature. Each line that you choose to activate will go from $0.01 to $5 with the wager, using anywhere between 1 and 20 coins, while denominations range from $0.01 to $0.25. Cover all 25 lines, at the maximum bet, and you will end up with a total of $125. A total of 500 coins will be used for that purpose. As for the big prize, the game offers 9,000 times what you invested on each payline, so that’s up to $45,000 if you went with the maximum line bet. The design is one of the slot’s biggest advantages, the symbols being well handled, as long as we’re not talking about the playing cards. There are the cards as well though, plain and each one colored differently, but with no connection to the marine theme. The background picture is filled with coral and other types of underwater life, and even a few sharks seen in the distance. It’s an enjoyable design, though not extraordinary. Symbols: Diver (9,000x, wild), Submarine (scatter, 100x the wager), Treasure Chest (1,000x), Scary Fish (500x), Jellyfish (200x), Snorkeling Gear (200x), Ace (150x), King (150x), Queen (125x), Jack (125x), 10 (100x) and 9 (100x). It’s a decent game, with better than average prizes, with graphics that could be described the same way, and with a theme that many will consider a good choice. 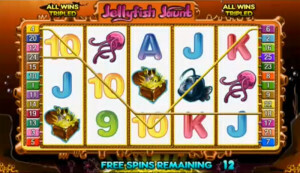 You will find Jellyfish Jaunt at any online casino which chooses to use software from Microgaming, playable either for free or for real money.